Spalding, the largest basketball equipment supplier in the world, and the Canadian Elite Basketball League announced Tuesday that they have entered into a three-year partnership agreement that makes Spalding the Official Basketball of the CEBL. Spalding will provide each of the league's teams with basketballs for practices and games, as well as non-competition balls for community events. Spalding will be the exclusive basketballs sold in CEBL and member team stores and retail environments. Additionally, each CEBL team will have Spalding branded tables on the court following each game where players will sign Spalding-branded autograph cards for fans. Spalding will be featured on each team's and league's website and social media platforms. "We are very pleased to welcome the iconic Spalding brand to our family of partners," said Mike Morreale, Chief Executive Officer of the CEBL. "Spalding had been part of basketball for more than a century. If speaks to their passion for sport that they are now joining us in creating a new basketball experience for fans and growing the game across Canada." Spalding developed the first basketball for official use. If has been the official basketball of the National Basketball Association for 33 years, and is the official basketball of the Women's National Basketball Association. "It is undeniable that basketball is on the rise in Canada. The level of talent the country has produced the last few years has been phenomenal," said Joe Agro, Spalding Canada Vice President and General Manager. "As a basketball organization we are dedicated to growing the sport in Canada, and our partnership with the CEBL is a testament to this commitment. We are proud to be working with a league that shares our passion. We look forward to working with the CEBL and providing Canada's elite basketball talent with equipment that will take their game to the next level." Spalding is also the official backboard of the NBA and NCAA. The SPALDING trademark is owned by Russell Brands, LLC. 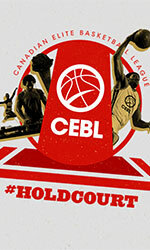 The CEBL, the official professional league partner of Canada Basketball, opens its inaugural season in May with franchises in Edmonton, Guelph, Hamilton, Fraser Valley (Abbotsford), Saskatchewan (Saskatoon), and Niagara (St. Catharines). Teams will play a 20-game regular season, culminating with a league championship playoff at a site to be announced. CEBL rosters will be predominantly comprised of Canadian's playing professional during the traditional basketball season, as well as a limited number of international and U SPORTS players.